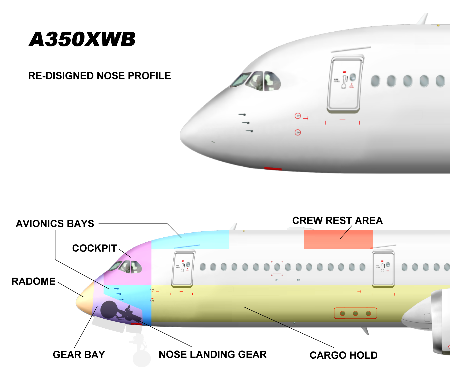 July 2006, when the A350 XWB was named A280 for some hours. Trick or Treat? 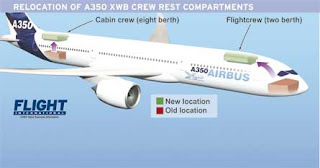 In mid-2006 Airbus undertook a major review of the A350 concept. 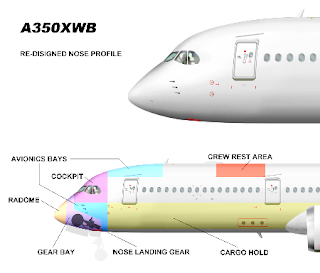 Previously, on October/2005, full industrial launch of the A350 program was announced; a derived from the design of the existing A330 with modified wings, new engines and the same fuselage cross-section but in Al-Li. Airbus faced almost immediate criticism on the A350 project from ILFC, GECAS and Singapore Airlines "Having gone to the trouble of designing a new wing, tail, cockpit" and adding advanced new materials, Airbus "should have gone the whole hog and designed a new fuselage." On 14/July/2006, during the Farnborough Airshow, Airbus announced that the re designed aircraft would be called A350 XWB (Xtra-Wide-Body). 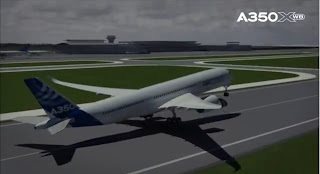 There was some previous speculation that the revised aircraft would be called the Airbus A370 or A280, with Airbus going as far as accidentally publishing an advert referring to the aircraft as the "A280" on the Financial Times website. That's because it was reportedly only decided to name the new widebody A350XWB on monday. 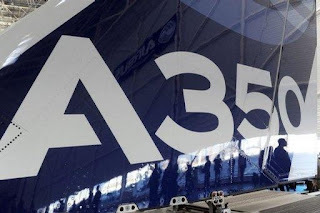 Untill the evening before the show at Farnborough, the choice was open between staying with the A350 name or rename it A280, and then later call the A320 successor the A180. In China, the number 8 indicates prosperity, wealth, success or social status. And numbers 28, 38, as eight means prosperity, twenty eight equates to 'double prosperity', 38 being one of the luckiest, often referred to as 'triple prosperity'. Singapore Airlines reserves flight numbers beginning with the number 8 to routes in China and Korea. The Air Canada route from Shanghai to Toronto is Flight AC88. The KLM route from Hong Kong to Amsterdam is Flight KL888. 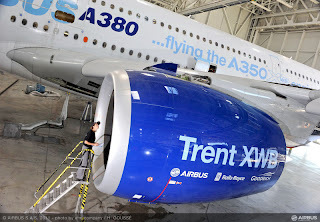 Airbus and Rolls-Royce are keenly aware that Qatar Airways and Emirates, two of the most outspoken and demanding airline customers for the A350 XWB, are watching flight-tests of the Trent XWB engine like hawks—particularly as the engine endures the heat and dust of recent flight trials in the Middle East (where sand and dust traditionally block seals and cooling holes in turbines). At Al Ain in the United Arab Emirates, the latest test version of the engine for the A350-900 was brought for evaluation last summer under the wing of Airbus's A380 flying testbed. 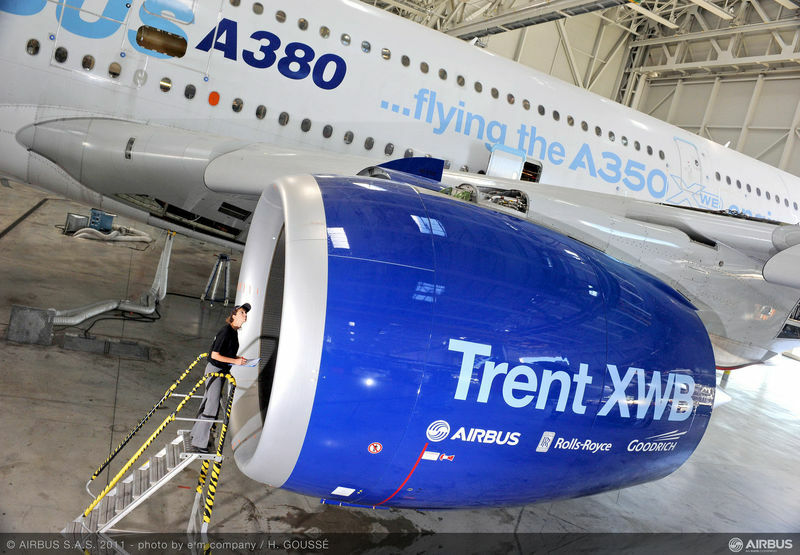 The evaluation was a “good positive test because it proves the engine has margin in high ambient temperatures,” says Trent XWB program director Chris Young. “We put a lot of design features into the engine to make it tolerant to those conditions. Emirates and Qatar are key customers in the Middle East, so we are making the engine tolerant to those conditions,” says Young. Bleed air off-takes, for instance, have been designed to ensure they scavenge a supply from the inner walls of the compressor rather than the outer walls. Dust particles tend to centrifuge to the outer walls, so positioning off-take valves on the inner walls places them in cleaner air. In addition, Young says, the cooling holes in turbines have been specially shaped to prevent particles from building up. Overall, the engine has performed better than expected in terms of specific fuel consumption, says Young. Initial testing “took the engine around the whole envelope, including high angles of attack, and throttle-slamming. For that work the engine was kept around the Toulouse area. Then we put the higher-modification engine standard on the A380 and conducted the hot environment tests at Al Ain,” he notes. 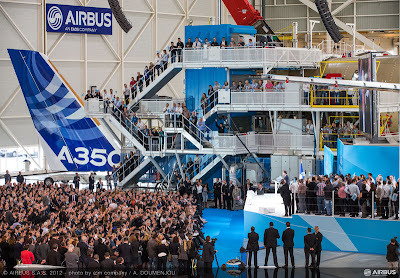 During the A350 XWB FAL inauguration, Airbus CEO Bregier insists that Airbus will build all three planned versions, even though he admits that customers have “less appetite for the -800,” the smallest variant. “The market will move slightly to bigger aircraft. But we are observing that trend with other models, too,” he says. 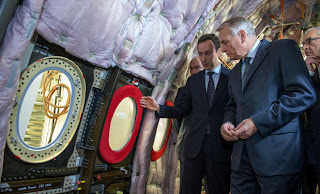 Although Airbus envisages the -800 being the second model produced, due to enter service in mid-2016, Didier Evrard said in the FAL inauguration that there is still flexibility in its schedule to advance the -1000 from its entry-into-service date of mid-2017 if required. "The sequence may change depending on the market if there is increasing demand for the -900 and -1000." The A350-800 is in the same size class as the A330-300 but has a lighter airframe, more range, and a lower design fuel burn than either the A330-300 or the A330neo. The further the A350-800 is delayed, the better chance for the A330neo. And Airbus is priorizing sales of A350-900 and -1000. 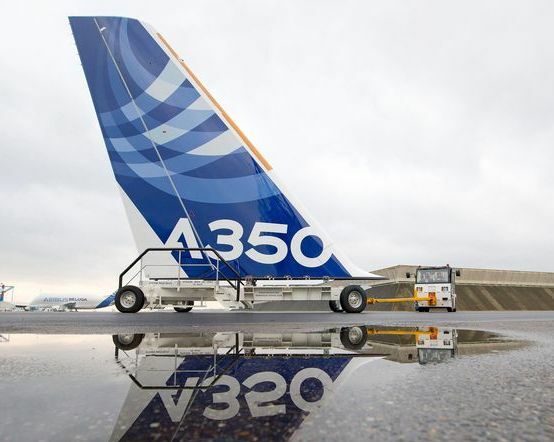 Airbus is trying to reassure suppliers and customers that the A350 XWB remains on track for first flight in the summer of 2013—and on time for delivery in the second half of 2014. “Our message is: The program is on plan and the upcoming major milestones will be on plan, too,” Chief Operating Officer Guenther Butschek said. During the FAL inauguration, the real stars were test airframes MSN5000 and MSN001. Their engines and other major components - including horizontal stabilizer, the tail cone and a vertical tail plane freshly painted in Airbus livery - were on display. 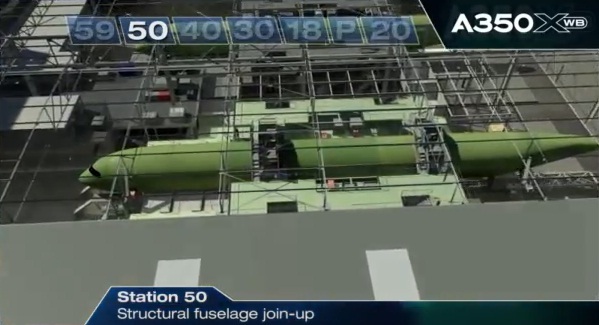 The fuselage of MSN001 is adjacent to it, at Station 50. One of the wings for MSN1 has arrived and is in the final assembly hangar next to the fuselage –already joined. The other is expected to arrive before Halloween. In November, major milestones are planned with the transfer of the fuselage to the Station 40 and the fuselage power-on, the empennage installation and wing joining. 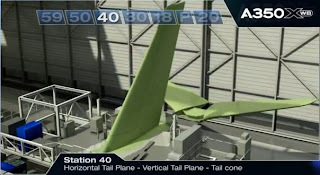 After that, the pylon and main landing gear installation also will be done in the Station 40. A350 XWB Program head Didier Evrard reminded the audience that the aircraft started "with a blank page that we gave to 10,000 engineers." 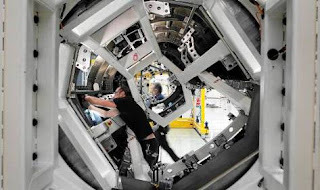 "In turn they gave us a product that burns 25 per cent less fuel, offers up to 8,000 miles of range and provides extra light, extra space and extra comfort," he said. 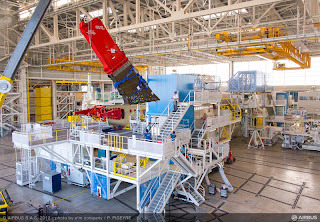 The A350 final assembly line is now called the Roger Beteille building. 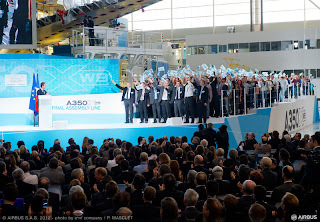 In the company of Airbus CEO Fabrice Brégier and the French Prime Minister, Roger took to the stage to a standing ovation to sign the inaugural plaque. 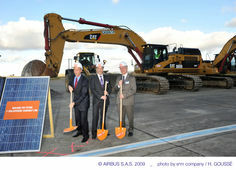 The site where Airbus' newest wide-body twin jet will be assembled bears the name of the man who launched is first one. But who is Mr. Beteille and who decided to bestowed on the A350 XWB FAL hall? 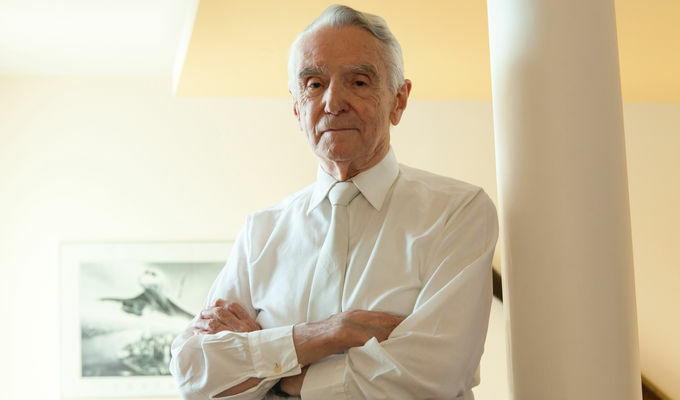 Mr. Beteille, 91, was one of the founding fathers of Airbus in the late 1960s and a key figure behind the development of the original A300 and, more than a decade later, the introduction of fly-by-wire technology for the A320. 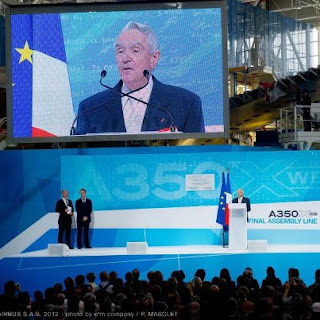 As a long serving general manager, Béteille designed the workshare agreement between Airbus nations and played a decisive role in securing the A300's first customers. He launched not only the A300 and A310 but the concept of an Airbus family. He lent his support to the A320 and the development of fly-by-wire controls in the years before his retirement in 1985. The choice of whose name should be bestowed on the FAL "was pretty simple," Fabrice Brégier said. "One person stood out. 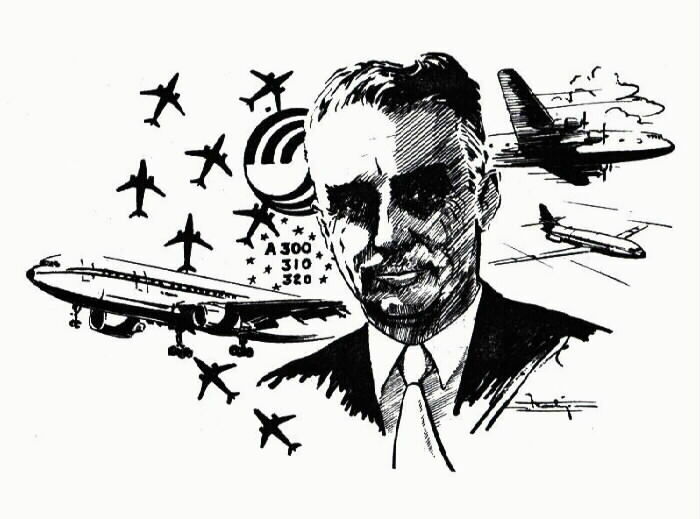 Roger Béteille was an Airbus pioneer, one of our industry's greatest innovators." 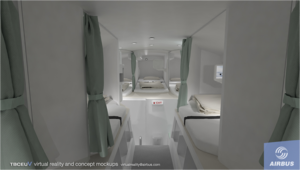 Where the pilots and flight attendants sleep and eat? 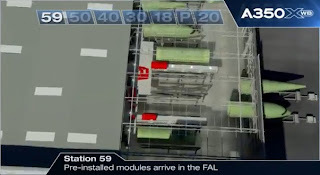 Where are the rest areas in the A350 XWB? 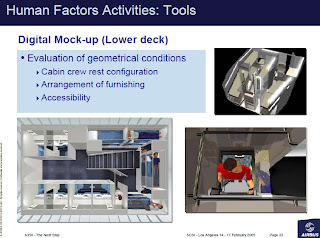 In a mix of different factors like aerodinamic, revenue, cargo & seat capacity, security, airlines needs, fire safety standards, airworthiness regulations, ground service aspects, emergency abatement, crashworthiness, emergency evac, comfort, health, crew performance.... the location of the crew rest area was modified when the A350 was re-configured to A350 XWB. Original configuration, below the cockpit. 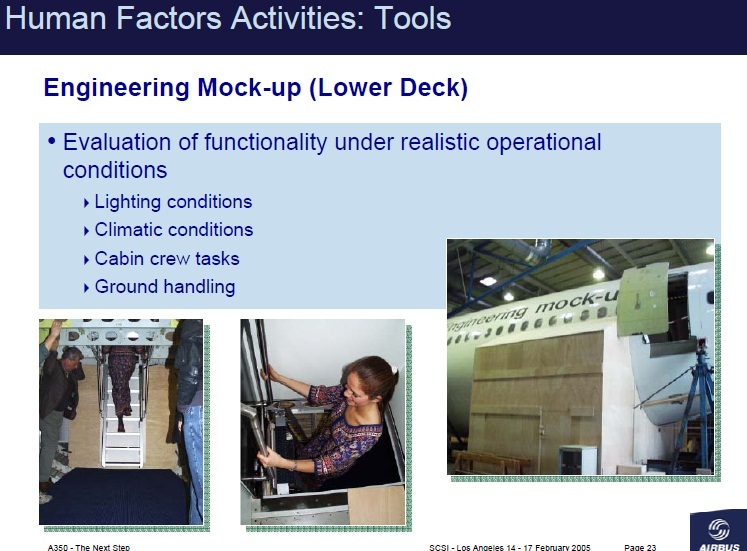 Airbus decided to move the A350 crew rest -for the pilots- from below the cockpit, in the area of the avionics bay, to above the main cabin just aft of the cockpit. This is the location favored by Boeing on its 777 and 787. Putting the crew rest below the cabin takes up valuable cargo space, Boeing argues. Current configuration, above main cabin. For the first time in Airbus aircraft –and after benchmarked Boeing´s configuration-, the A350 XWB’s crew rest compartments are in the aircraft crown. 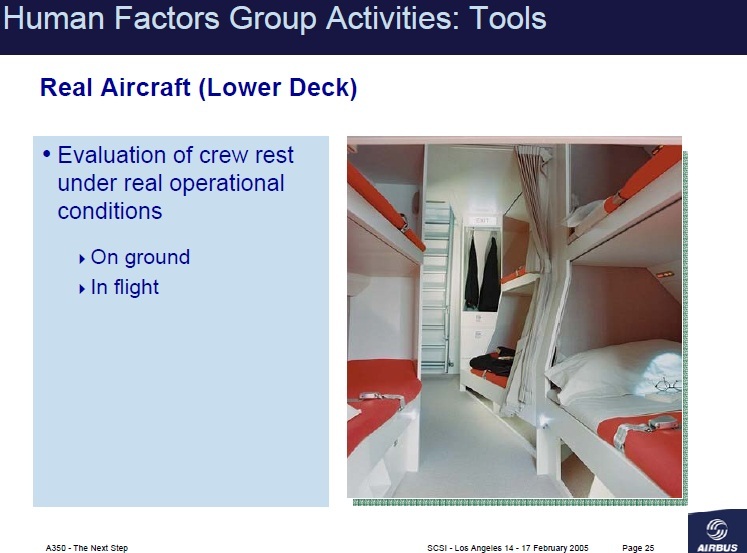 There are two separate Crew Rest Compartments: a Flight Crew Rest Compartment (FCRC) intended to be occupied by flight crew members only, and a Cabin Crew Rest Compartment (CCRC) intended to be occupied by cabin crew members. Both types of Crew Rest Compartments (CRC) are installed in the overhead area with access from the main deck. 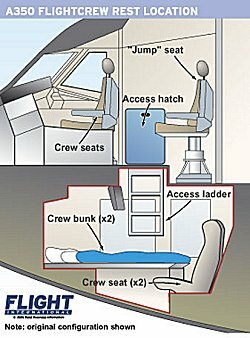 The rest area for flight crews is located immediately aft of the cockpit. Its staircase access is separated from the passenger cabin by a secure door, which creates a quiet and protected zone including a dedicated floor-level lavatory for pilots. The overhead rest area has two bunk beds, along with a seated work station. 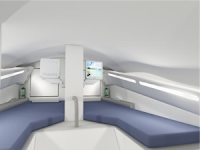 For cabin crew, a rest facility in the A350 XWB’s rear fuselage accommodates up to eight bunks. It includes a full-height standing area, providing a comfortable zone that allows crews to prepare and dress more easily. While optional, the large majority of customers have selected these crown-located crew rest areas. But it is a retrofitable feature. 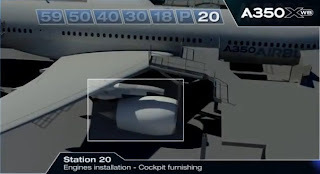 The A350 XWB crew rests, located overhead in the crown area, have no impact on revenues space – whether cargo or passenger – and contribute to the efficiency of the A350 XWB cabin. 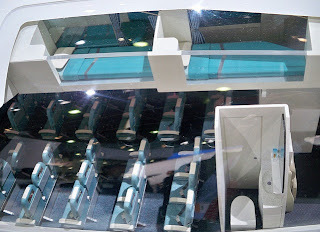 The A350 XWB provides functional rest areas for cockpit and cabin crews without reducing revenue passenger seating. The XWB’s extra wide fuselage allows for optimized rest area options on long-range flights for cockpit and cabin crews, offering facilities that are truly private – and which do not reduce the number of revenue-generating passenger seats available to airline operators. Entrances to these rest areas are located outside the passenger cabin, so they do not use up seat space. “This is the first time a crew rest area on an aircraft will have no revenue-generating impact,” A350 XWB Marketing Director Bausor said. In this 3:30 min video we can watch the final assembly of the A350 XWB step by step, station by station. 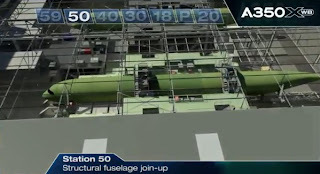 Currently, the MSN5000 and MSN001 are both in the Station 40 and Station 50 respectively. Click in the image to watch the complete video. AIRTAC means Airbus Technical AOG Center. 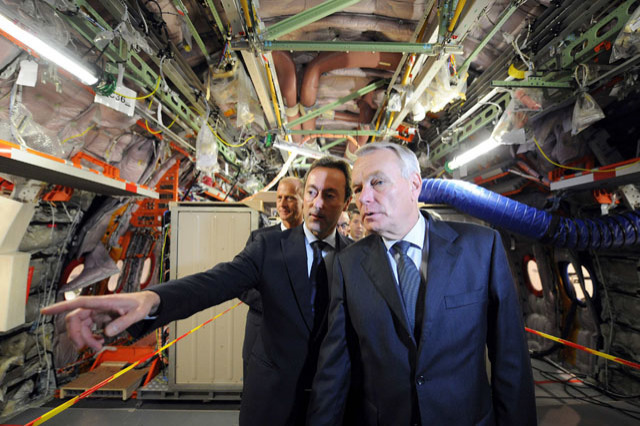 Airbus inaugurated today’s set up of AIRTAC’s modern facilities in Blagnac (France), in December 2005. 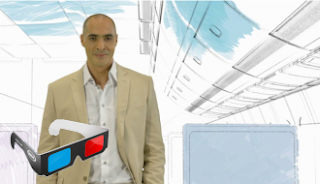 The new facilities are fitted with the most innovative technology and leading-edge solutions. These enhancements represent a multi-million Euro investment that enables Airbus to provide its worldwide customers with improved technical support, and an even wider range of engineering services. The aim of AIRTAC’s team is to minimize on-the-ground time for aircraft for troubleshooting and repairs and it has a complete staff of 44 people composed of 8 teams available 24/7 of structure, systems and maintenance engineers. AIRTAC answers more than 13,000 queries from Airbus customers, of which around 75% of the issues were solved directly by AIRTAC. AIRTAC is Airbus’ front line with the customers and is the entry point for any AOG, but also for accidents and major incidents. The AiRTHM service solution is currently available and is used to ease each A380 Entry-Into-Service (EIS). This service will then be extended to the Flight Hour Services (FHS) customers. This service has been launch to be ready with the A350’s EIS in 2014. With the introduction of the new generation aircraft, the maintenance systems (Centralized Maintenance System, Aircraft Condition Monitoring System, etc.) enable to get access to a large number of parameters, both in-flight and on-ground. 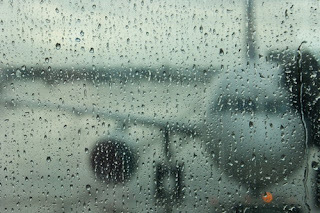 Moreover, by using ACARS (Aircraft Communication Addressing and Reporting System), Airbus is now able to collect those parameters and analyze the system data from a remote location. Thanks to this technological evolution, AiRTHM will be available to provide a new and innovative ‘real time health monitoring’ for A350 XWB aircraft. 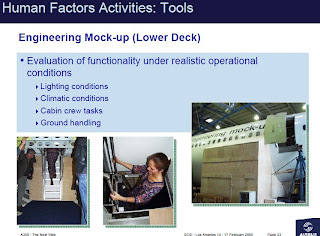 It is based on new processes developed by the Airbus AIRTAC-MIT (Maintenance Innovation Team) with the objective to improve the A350 customers’ Operational Reliability and maintenance scheduling, whilst reducing the associated costs. Alestis Aerospace is one of the three Spanish Tier1 and was born from the integration of two relevant companies in the sector: SK10 and Sacesa. The tail cone S19.1 is manufactured in composite in a unique skin, with cobonded spars, optimizing the weight, reducing the number of parts and avoiding the subassembly. There are some metallic parts, manufactured by another facility of Alestis group in titanium to avoid corrosion. It has been more than 3 years of hard work, with a team of more than one hundred people allocated, four different facilities in Spain and three composite manufacturing technologies; the Automated Fiber Placement (AFP) in El Puerto de Santa Maria (Cádiz) -essential to deal successfully with the curvature of the piece-, the Automatic Tape Laying Machine (ATL) to manufacture spars and hand lay up for the frames in San Pablo (Sevilla). Metallic parts are manufactured in the facility in Miñano (Vitoria) and the final assembly in Puerto Real (Cádiz). 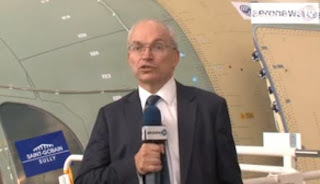 Section S19.1 of the A350 XWB –a diameter of 2,5 meters and 4 meters long- is delivered to the FAL in Toulouse where is integrated to the fuselage after the Horizontal Stabilizer junction. 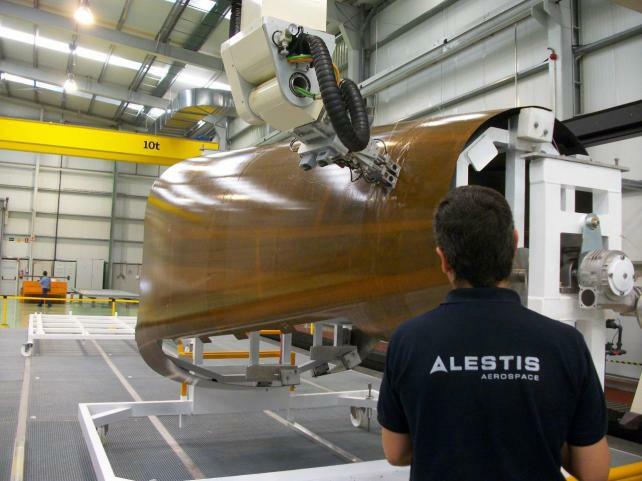 Alestis Aerospace also develops the Belly Fairing of the A350 XWB, a complex aerostructure which shipset for MSN001 was delivered last February. Currently, Alestis Aerospace is facing a cash crunch and from May this year, it was placed under court administration so it is operating from one bill to the next. 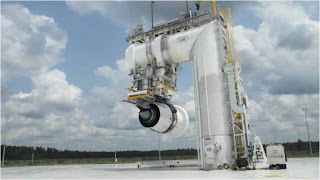 Money troubles that Alestis is facing is partially related to the heavy investments done to develop parts for A350 XWB in expectations of fat payoffs. Airbus has taken the control of the group as new CEO was former managing director of Airbus Military facility of Tablada (Sevilla). Already official: Singapore Airlines to order additional #20 A350-900. During the A350 XWB FAL inauguration, there was an accidental early disclosure by the French prime minister of this purchase order. 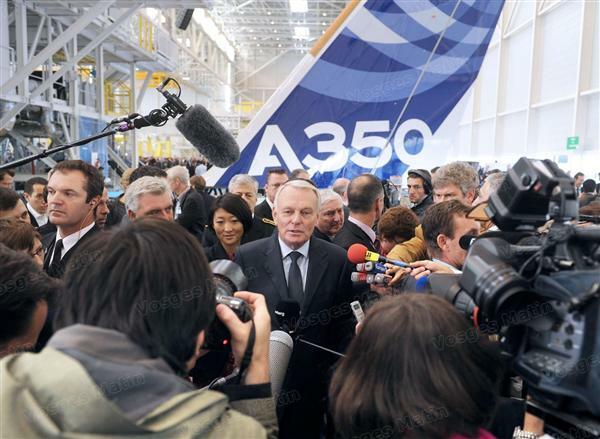 Jean-Marc Ayrault, who has just returned from Singapore and Philippines to help drum up business for French companies, told an audience of 1.000 Airbus workers & media his trip had highlighted the importance of remaining competitive on world export markets. During Ayrault's trip, Philippine Airlines confirmed an order for 10 Airbus A330 jets on top of a purchase in the summer. But departing from a prepared speech, Ayrault then referred to billions of dollars of plane orders that did not appear to correspond to business already announced from those countries. "I would like to add that during this trip, Airbus signed an order for 15 aircraft and took options for the A350 and possibly the A380." Singapore Airlines (SIA) already had other #20 A350-900s on order. The new order has not been for A350-1000 but for A350-900. 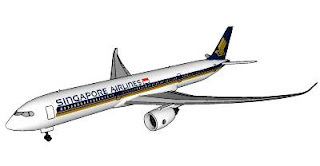 That would be a big wake up call for Boeing as Singapore Airlines is big 777 user. SIA operates #19 A380-800 superjumbos and as part of its deal with Airbus, the European aircraft maker will buy back #5 A340-500s, which will be removed from service in the fourth quarter of 2013. SIA's order of #20 Boeing 787 -for delivery starting in 2014- have been transferred to the long-haul low-cost unit Scoot. 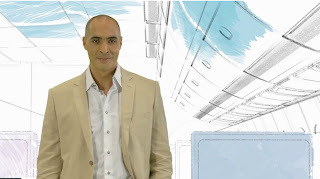 In this new video of the cabin interior of the A350XWB, two passangers, one hostess, a pilot and an airliner imagine the cabin of their dreams. Occurred 40 years after the maiden flight of its game-changing A300. Held inside this purpose-built L-shaped facility next to Toulouse-Blagnac Airport in France. Marked a new industrial milestone in the A350 XWB program. 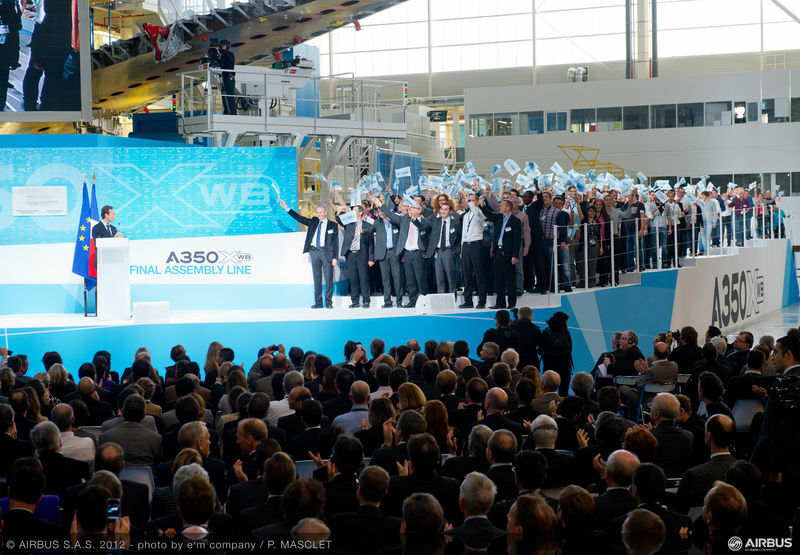 Was attended by more than 1,000 representatives from customers, suppliers and partners, along with elected officials and other invitees – who were joined by an equal number of Airbus employees, many waving A350 XWB flags. Put the company on track to becoming a world-leading commercial airliner manufacturer. Airbus has showed for first time the vertical tail plane VTP of the first flyable A350 XWB (MSN001) painted in the Airbus livery. The Vertical Tail Plane-VTP has been assembled at Airbus Stade-Germany with parts manufactured at Aciturri, Spanish Tier1 with design & built responsibility. Aciturri, with more than 1,100 employees at 7 facilities at Spain has a team with engineering, industrialization and manufacturing roles, working since more than 4 years in the project with a very close concurrence with Airbus team from Getafe, Hamburg and Stade in this project. 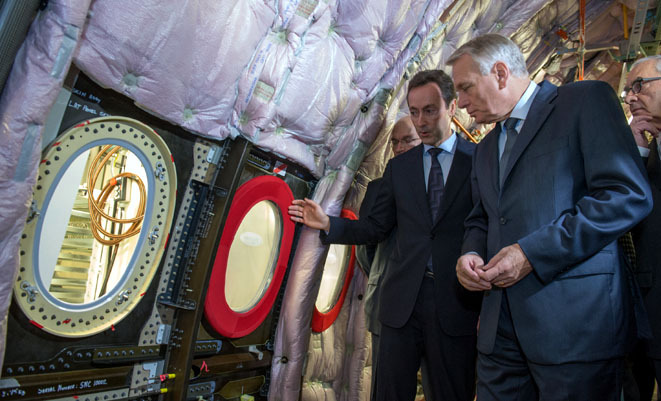 Aciturri has capability to manufacture both metallic and composites parts with background in other Airbus programs. 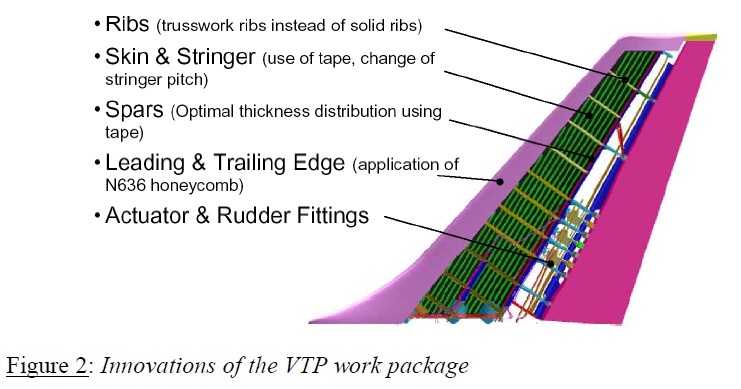 The movable part of the VTP, the Rudder, has been developed by Airbus (product engineering at Hamburg) and primary parts have been manufactured and assembled by Aernnova, Spanish Tier1 in charge of the industrialization of this workpackage. 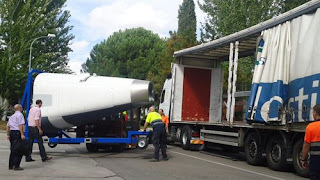 The Rudder is delivered to Stade for installation in the VTP just before the final inspection and delivery to the FAL, where the VTP is final-painted with the airlines colors at the FAL. 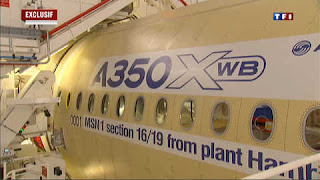 The first prototypes, the livery will be painted as this MSN001, in Airbus blue and white. The external livery of the A350 XWB, including the vertical tail plane, is painted with an environmentally friendly, chromate free primer paint. In addition, following best practice from the car industry, Airbus will use a new base coat/clear coat system which requires less paint and less solvent. 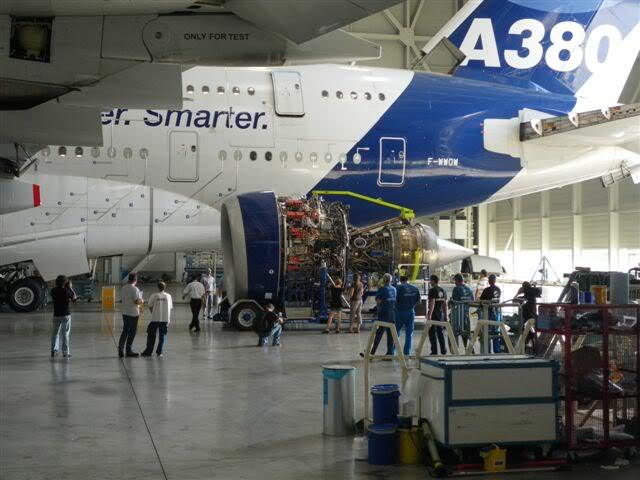 This eco-efficient painting process also means that less detergent will be needed when washing the aircraft. Inside, Airbus will use a water-based paint wherever possible, one of the most environmentally friendly types of paint available. 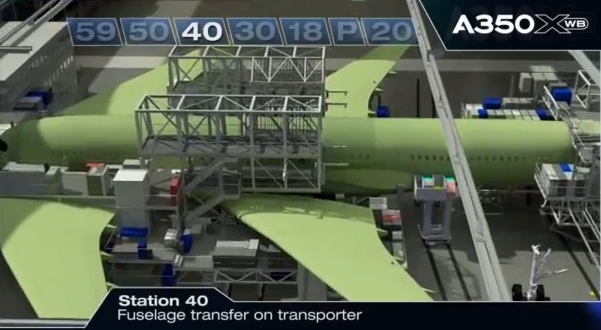 This video of the french TF1 channel shows the A350 XWB FAL status and different type of activities. It also includes some words from Airbus CEO Fabrice Bregier in front of an A380. Airbus will celebrate on 23/October the official inauguration of the A350 XWB Final Assembly Line in the presence of Airbus President & CEO, Fabrice Brégier, as well as the French Premier ministre Jean-Marc Ayrault, Günter Butschek COO Airbus and Didier Evrard A350 XWB Program Director. Airbus will celebrate on 23/October the official inauguration of the A350 XWB Final Assembly Line in the presence of Airbus President & CEO, Fabrice Brégier. 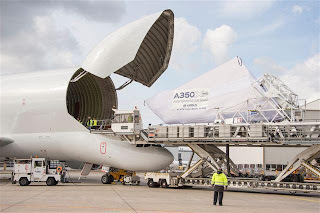 The ceremony will be also attended by the French Premier ministre Jean-Marc Ayrault, Günter Butschek COO Airbus, Didier Evrard A350 XWB Program Director and Roger Béteille, the 91 years old chief engineer and Airbus general manager when the european consortium was created. 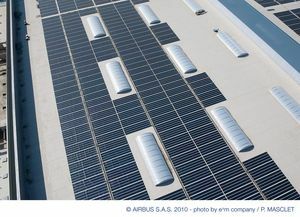 The A350 XWB final assembly facility, a 74,000-square-metre structure which construction was formally began on 14/January/2009, has been outfitted with 22,000 square-metres of photovoltaic cells in the roof, which convert light energy into useable electricity, allowing the building to produce 56% of its energy. 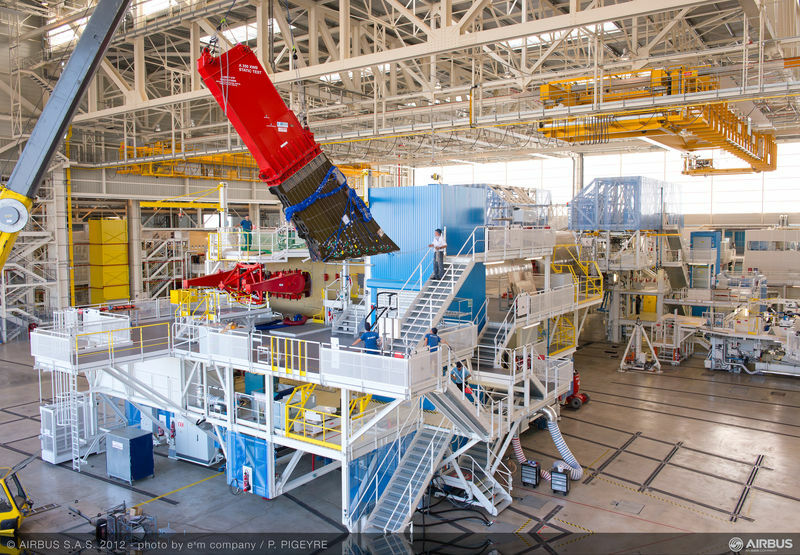 Construction of the A350 final assembly line involved investment costs of 140 million euros. The dedicated area includes aircraft halls, offices, workshops and logistics areas, as well as taxiways and roads. 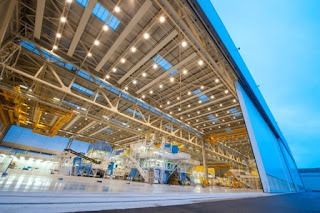 Airbus has invested in a green eco-efficient method and technologies with the construction of this Final Assembly Line (FAL). The building reused up to 10,000 cubic metres of existing materials from the taxiway which was previously on the site, so reducing the volumes of deliveries required from quarries. Large windows include natural lighting, not only to reduce electricity consumption but also to improve working conditions. Additionally, an energy management system optimises the use of liquids and power around working hours. A350 XWB still a family of three?